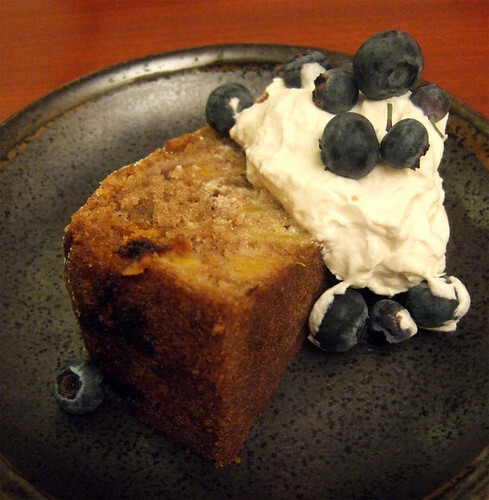 A few weeks ago, I had the great pleasure of tasting an amazing cake baked by friend and fellow food blogger Mary Luz. She brought a beautiful apple bundt cake to a dinner party for dessert. It was so incredibly delicious—a perfect balance of sweetness and tartness from the apples, the warmth of the cinnamon, and an excellent, moist crumb (with no butter!). Let's just say many of us went back for seconds...and thirds! Ever since that evening, I've been bugging Mary Luz for the recipe, who has been so kind to share it with me. 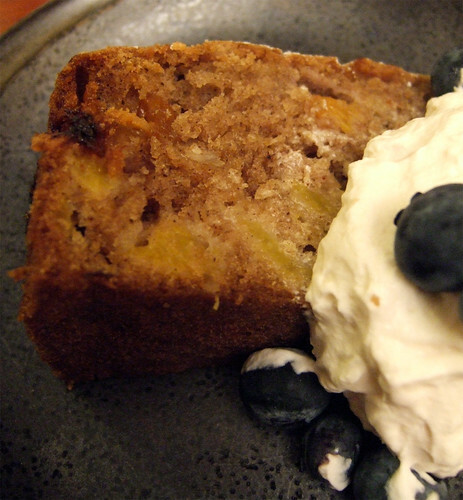 I've made a variation of it, using fresh, local peaches, but I'm thinking this cake would also be fantastic with other fruits—pears, plums, apricots, berries, nectarines, or even figs. It's a great cake to throw together in a jiffy for last minute guests. Served with some freshly whipped cream or good-quality vanilla ice cream and it's perfection. It'll be a hard task trying to stick to just having one slice! In a small bowl, toss the diced peaches with 1 tablespoon sugar and 1 teaspoon cinnamon until well combined. Set aside. In a medium bowl, sift together the flour, salt, baking soda, cinnamon, and nutmeg. Set aside. In a separate bowl, mix the oil and eggs with a whisk or with a beater until creamy. Add sugar and vanilla and mix to combine. Slowly add the dry ingredients to the wet ingredients and stir until just combined. Do not overmix. Using a spatula, fold in the diced peaches. Pour half the cake batter into a greased Bundt or 9"-round cake pan. Spread the apricot jam and sprinkle almonds on top, and cover with remaining half of the batter. Bake for about 60 minutes, or until a toothpick poked in the centre of the cake comes out clean. Remove to a cooling rack and allow cool for at least 20 minutes before serving. Can be served warm or at room temperature. Posted by Bonita at 3:05 p.m.
redpathsugar August 9, 2010 at 12:50 p.m.
Peaches mmmmmm. You could even whip up some of your own apricot jam using Redpath Quick Set-it's an easy process and the ingredients are right on the bag. If you have any more sweet recipes to share please post them on our wall; and if you like Cake Boss then enter in our contest to win tickets!